Whether you shoot families, weddings or models, you will have an advantage as a photographer if you know how to apply makeup well for the subjects in your photoshoots. Even if you work with a makeup artist, as the photographer, you are ultimately responsible for the overall look in your images, so you need to be aware of how makeup can contribute to the look of your images. Having a good knowledge of makeup for photoshoots will allow you to get the look you envisioned for your images, keep your subject or client happy and spend less time editing imperfections in Photoshop! The number one thing you need to remember about makeup for photoshoots is that the camera never captures makeup and color in quite as much vibrancy as is visible in real life. Therefore, it is very important that you apply more makeup for photoshoots than you would for going out and looking nice in real life. Even if you want a subtle makeup look in your photos, you still need to really exaggerate the makeup you're applying, because it will not show up as strong through the camera. Light bouncing off of makeup changes the way it looks, and makes it look less dramatic than it really is, and we are always lighting our subjects during a photoshoot, whether it be natural or artificial light. Be sure to apply, or at least keep checking, the makeup on the model or subject under the same type of light you plan to use to light the photos, or the makeup may look much darker or lighter in your images than it did during application. The best light to apply makeup under for photography is natural light, because it if the makeup looks good in natural light, it will look nice in almost any other light. Most electronic flash/strobe light is close in color temperature to the color temperature of average natural daylight. Therefore, if you will be shooting with electronic flash in a studio setup or outdoors, your best option is to use natural light to apply the makeup for the photoshoot. Fluorescent lighting will make skin look very pale and washed out. It gives off a green color cast, which can make a subject look almost ill. Avoid this lighting for applying the makeup if you can. Additionally, fluorescent light bulbs can have several different color temperatures, depending on the type of bulb, and even one particular bulb can vary in the intensity and color of light it gives off from moment to moment. It is hard to judge the true look of a subject's makeup under these conditions, so fluorescent lighting should be avoided. Incandescent lighting (a regular, old-fashioned household light bulb), gives off a much lower color temperature than natural and electronic flash light. The light will be a warm yellow light. This is actually very flattering to most skin, because it doesn't allow for detailed clarity of any flaws. However, you want to see all the flaws during the application process, since you need to cover them up and blend them in well for the photographs. Halogen bulbs are more similar to daylight color temperature than fluorescent or incandescent bulbs are, making them the best choice of artificial light to use if you can't use natural light. 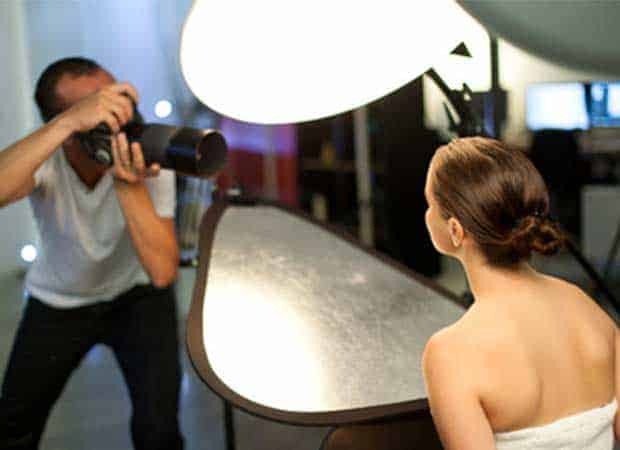 Some constant photography studio lights have halogen bulbs, so if you're shooting with these types of lights, try to use the same lights to light your model during makeup application. There are LED makeup lights now available that have adjustable color temperature. If you know you will be applying makeup for photoshoots on a regular basis and will not have access to natural light for application, this could be a good investment. Keep in mind that the quality of lighting during the photoshoot will also affect the look of the makeup. Very soft light will help smooth out details and texture, while hard or directional light will bring out any details and texture in an image. This means that if you plan to use more directional lighting (such as side light), you need to make sure the foundation and concealer cover well enough to keep the subject's skin looking smooth, even with the lighting working to bring out any texture from imperfections or wrinkles in the skin. You may choose to emphasize texture on the lips or eyes, in order to draw more attention to those areas in your image. In this case, you would want to use some directional lighting to bring out the texture of the eye shadow or lip color. If you choose to keep these areas looking smooth, you would want to use softer light and keep the lighting more to the front of the subject. Always start with a base of both moisturizer and primer, so that all of the other makeup will go on as smooth as possible, to reduce the editing you'll need to do later to hide wrinkles or imperfections. As far as moisturizers go, I have heard that Nerium is good option, but there are dozens more. If the subject has red skin, use a green tinted primer or concealer to counteract the red and save you more time editing skin flaws. All products you use should be matte to avoid adding any shine to the face. The possible exception is lip color, since a bit of shine on the lips can make lips look more full and attractive in a photograph. Additionally, avoid using products with SPF for photoshoots, since the ingredients can often make the face look shinier in images. The eyes are the focal point in most portraits, so you need to make sure the makeup really exaggerates the eyes, so they stand out very well. The bolder the color, the more defined the eyes will be. Even if your subject normally wears brown or gray mascara and eyeliner, bold black will look much better when photographed. You want to use two or three coats of mascara to make sure that the eye lashes will be visible in a photo. Additionally, use an eyebrow pencil to fill in the eyebrows. Fuller brows look much better in a photo than very thin ones. Particularly for subjects with blond and light colored hair, the eyebrows will not show up very well at all in a photo unless you define them with the eyebrow pencil. For eye shadow, use three shades, even if the color you or your subject chooses is neutral. Sweep the middle shade all over the lid and lower brow bone, dab the lighter color at the inner corner of the eye and apply the darker color just in the crease between the lid and the brow bone. This method creates depth and will make the eyes really stand out in your images. Blending is key to a great look in photographs. You know those small foam applicators that come in the case with eye shadow? Throw them out! Use a brush to apply each color and then another brush to blend the edges of each color, so that there's no abrupt lines of any shadow color. Note: you can buy specific eye shadow primer. I highly recommend using it (you would just lightly apply it all over the lid and brow bone before you start applying eye shadow). It not only extends the wearing time of eye shadow, but it actually makes the shadow color look much more vibrant and intense, which is what we want in order for it to show up well in photographs. In some cases, primer can actually make an eye shadow color look two or three times brighter than if it was applied on a bare eyelid. Do NOT use regular primer on the eyelid; make sure you buy a primer that is specifically made to be used on eyelids to avoid skin reactions! When choosing eye shadow colors for your subject, you want to complement their eye color, since you want to emphasize the subject's eyes in a portrait. For blue eyes, choose a warm tone to balance the cool blue. Champagne, golden brown and peach are good choices. 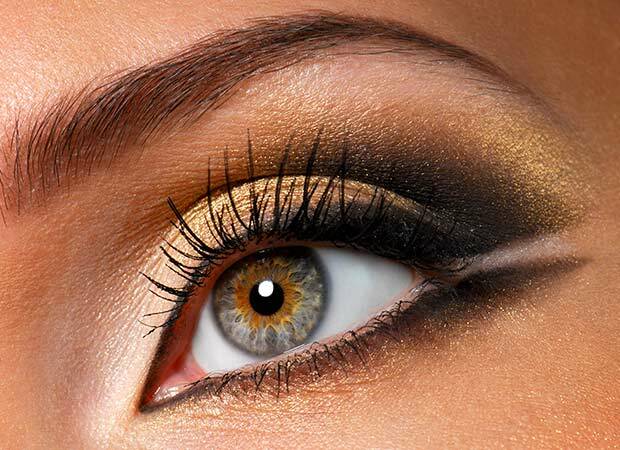 For brown eyes, most colors will look nice, since brown is neutral and will not clash with the shadow color. In particular, purple, bronze and navy work well. For green eyes, plum, pink and reddish browns are good options. For hazel eyes, gray, pink and dark purples will bring out the eye color. False eyelashes are another option for great eye definition. Choose a full set if you want true drama in your image; choose individual lashes if you want a more natural look in your image. Always apply the eye lash glue to the back of your hand, and then run the lashes through the glue before placing on your lid. Do not squeeze the glue directly onto the lashes, because if you have too much glue, you'll have trouble getting the lashes to lay properly. For blush, highlighter and eye shadow, you have the option of powder or cream products. For photographers who are just beginning to learn about applying makeup, powder is the better choice, since it is fairly easy to blend. Once you have some experience with blending color on a face, you can experiment with cream products, which typically are a bit longer wearing, but they take a lot of work to get the color blended into the skin. Always use the best quality makeup that you can. Cheaper makeup products may look cakey on the skin or even get crease marks in them, which can make the skin appear cracked or wrinkly. Some great options for quality makeup products and great color options are Pur Minerals, Cover FX and MAC Cosmetics. At minimum, make sure you keep the concealer, powder, lip color and lip gloss handy during the photoshoot for touchups. If you are working with flash and studio lighting, you will need to touch up the makeup more often, because the lights will be warm and can make the makeup start to melt or slip slightly. You will definitely need to reapply powder to ensure the subject's face does not appear shiny at any time. If you work with an assistant, this is a great job to assign to them. Don't forget hygiene at photoshoots! If you'll be using makeup for photoshoots frequently, invest in good quality makeup brushes, because you'll need to wash the brushes regularly, and cheaper brushes may shed and fall apart after several washes. Buy disposable mascara wands from a supplier like Sally Beauty, so that you are not using the same wand on more than one person. Mascara should be replaced every three months, even if it's been used very little. All other makeup products should be replaced every six to nine months, even if you haven't used it all up by then. If you follow these makeup tips when photographing, you will end up with photoshoots that produce great images and happy subjects, which will make a happy photographer!